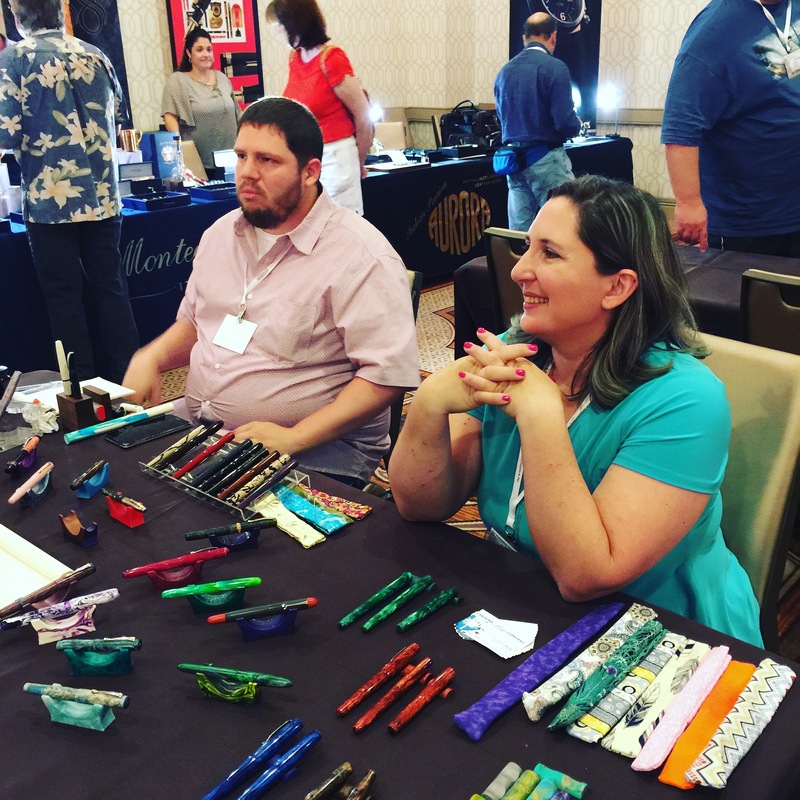 seeing more pens in one place than you’ve ever seen before. 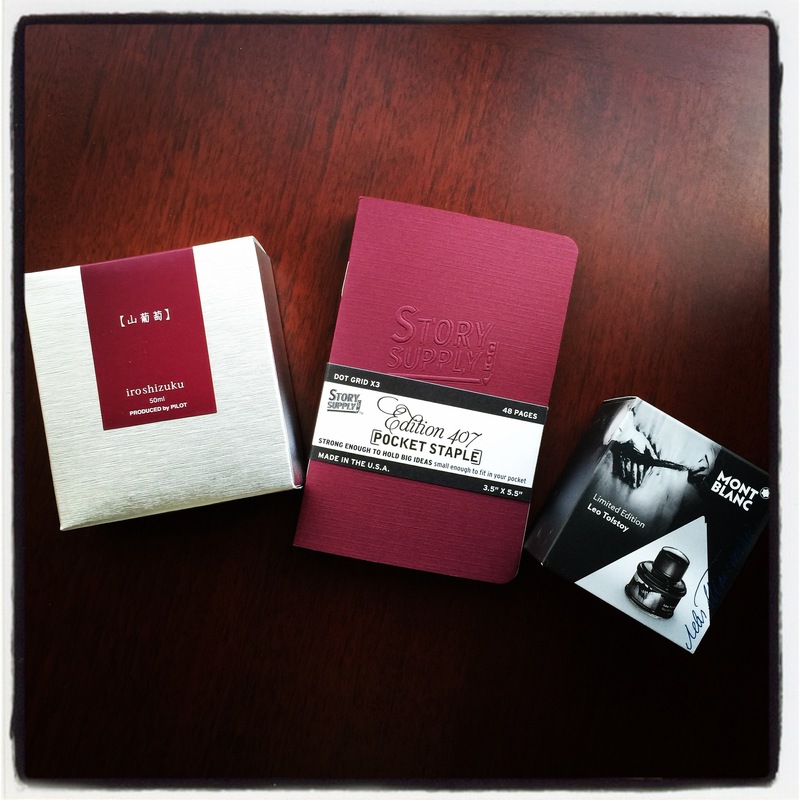 For adding to your already healthy stash of ink and pocket notebooks. 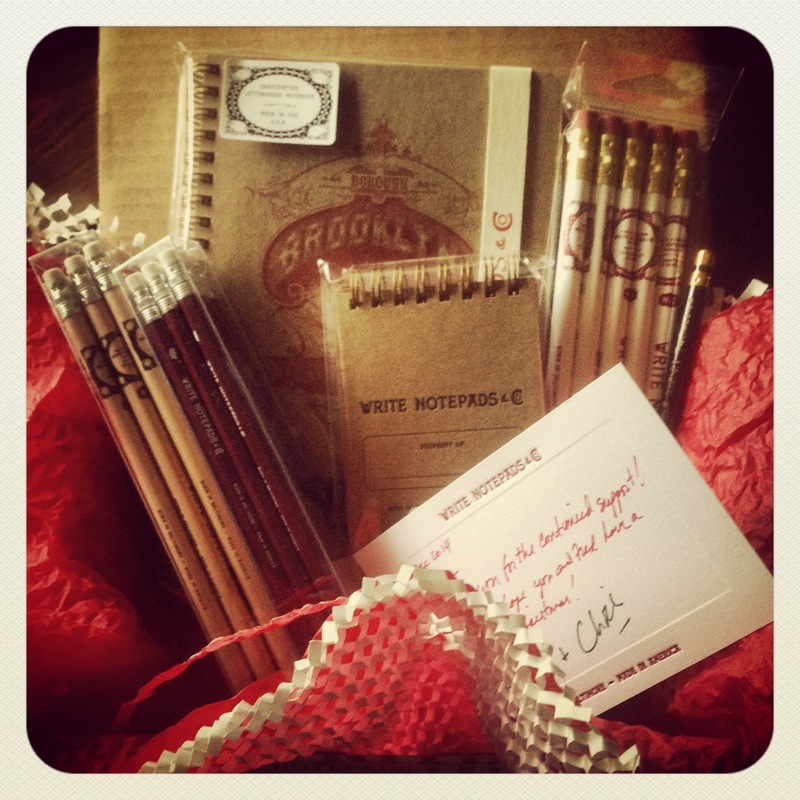 For meeting the very nice guys who make those notebooks. AND the man who made the material for that pen. For having a little nib work done. 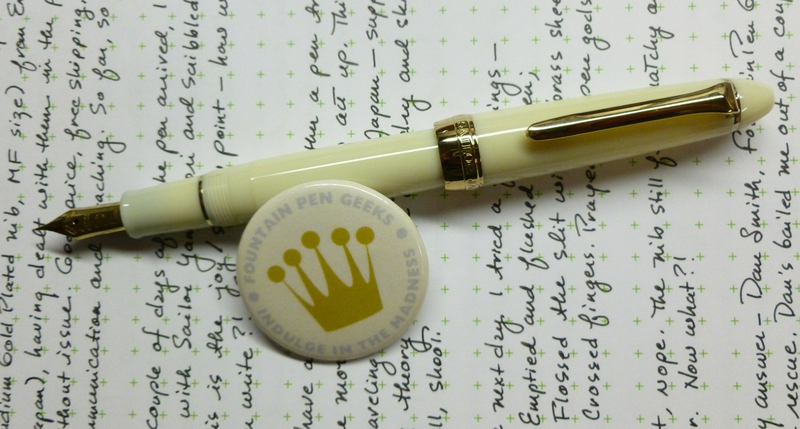 For helping a friend at home get started with this fountain pen obsession hobby. For testing the patience of your “not really into pens” husband. 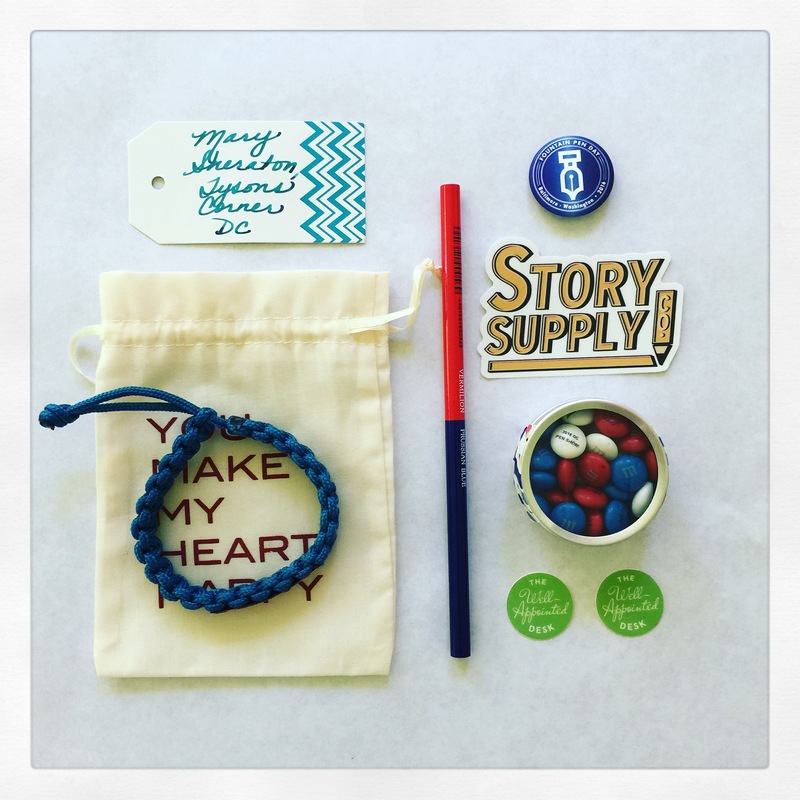 For saying a few words of thanks to the people who inspire you. it’s about spending time with friends. 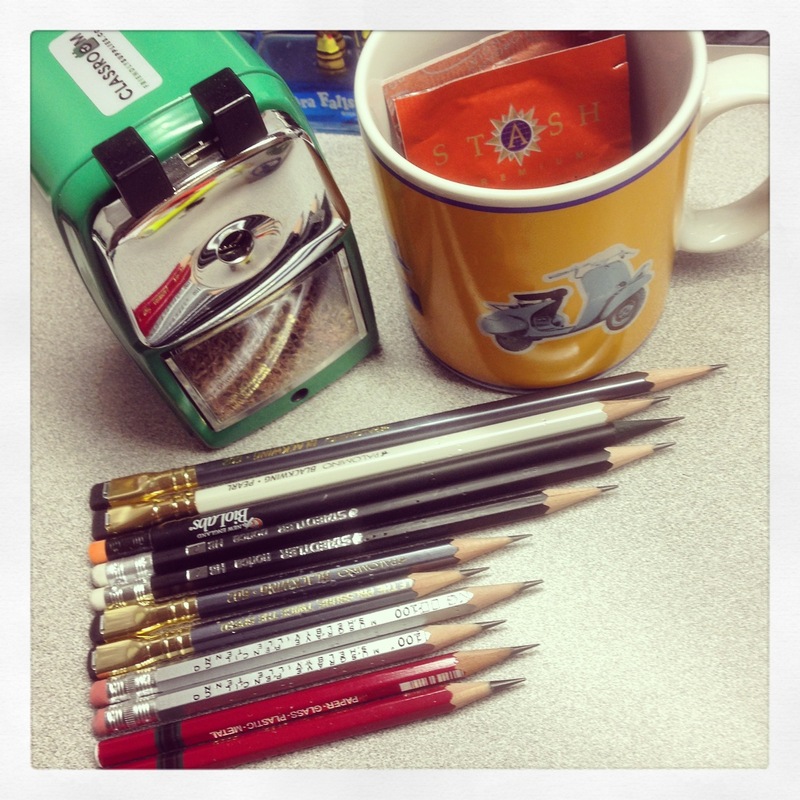 The pens, paper, notebooks, and ink are all great, but there’s so much more. 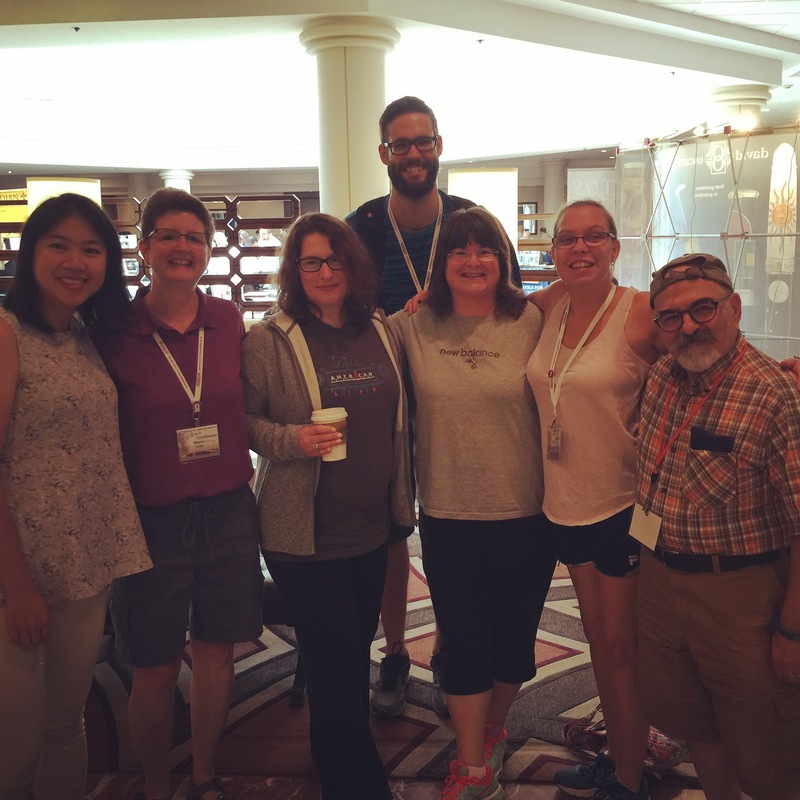 There’s sharing and hugs and laughter. There’s friendship. There’s love. 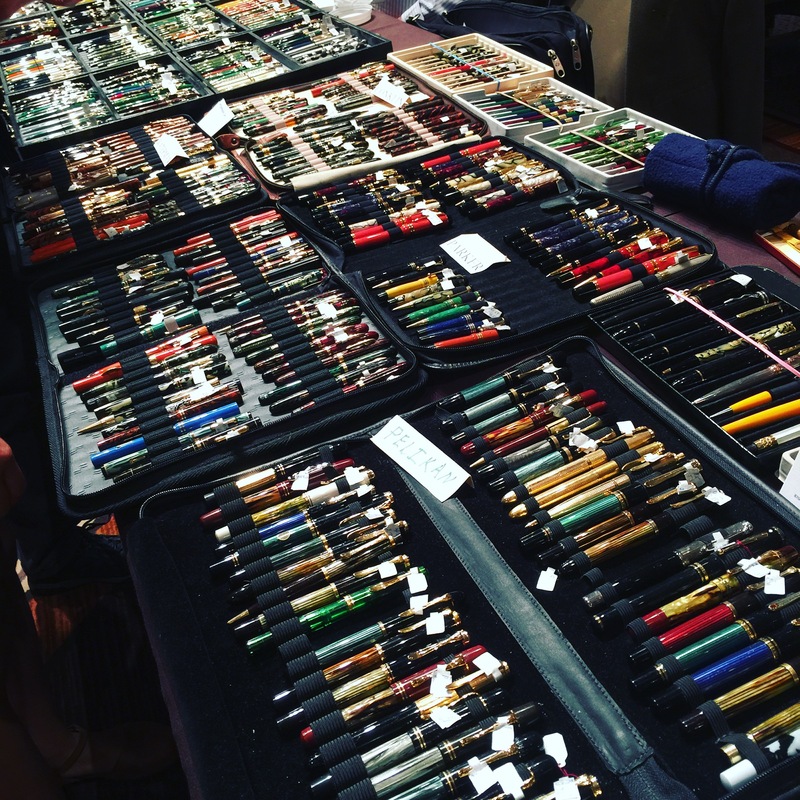 There really is nothing like a pen show. It’s déjà vu all over again. 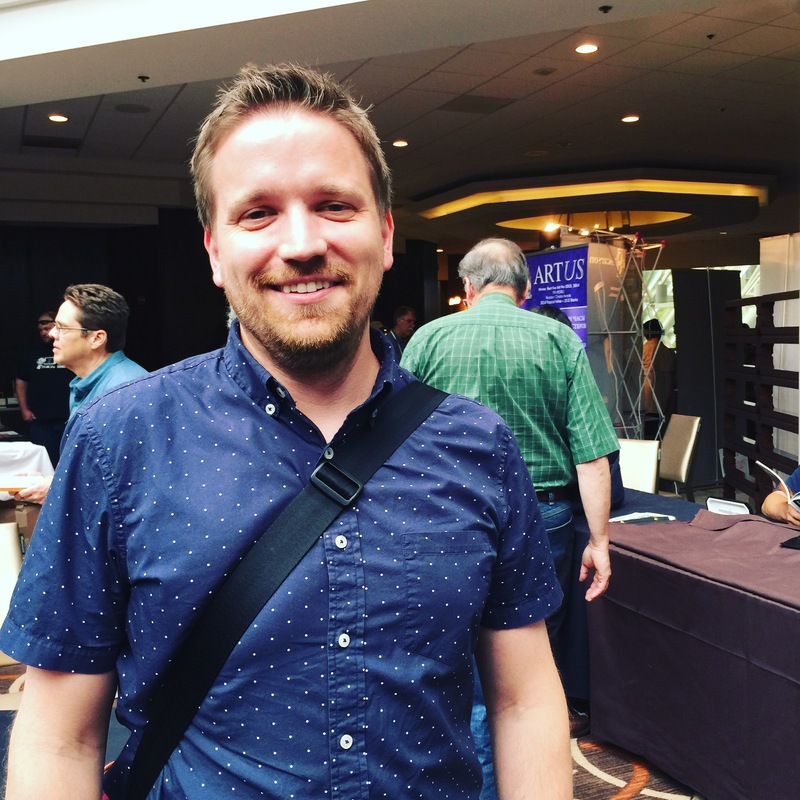 Yup–it’s another Architect Grind by Dan Smith (@nibsmith). When I sent him my Edison Glenmont (broad) for this grind, I also sent along this Levenger Element Guilloche (medium) for the same treatment. 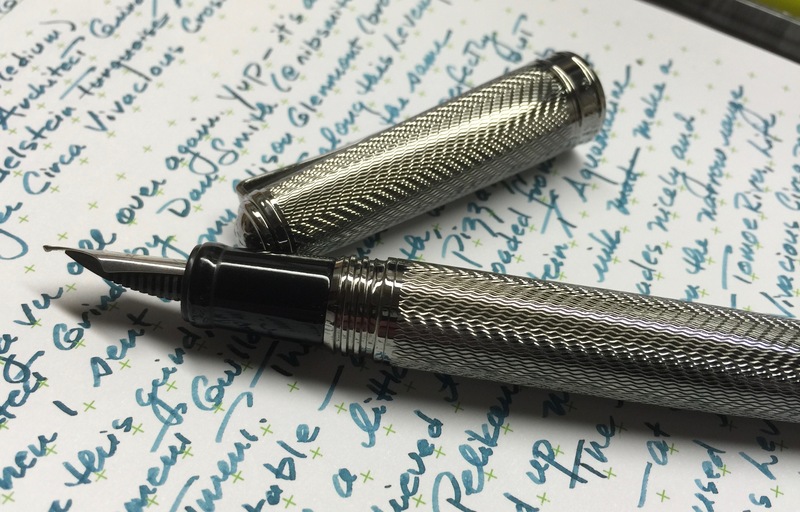 The original nib was perfectly acceptable—smooth and wet—but needed a little more pizzazz. Dan’s mad nib skillz took this nib from acceptable to WOW! Loaded from my new bottle of Pelikan Edelstein Aquamarine—Edelstein’s 2016 Ink of the Year—this great looking pen, beautiful ink, and jazzed up nib make a great team. 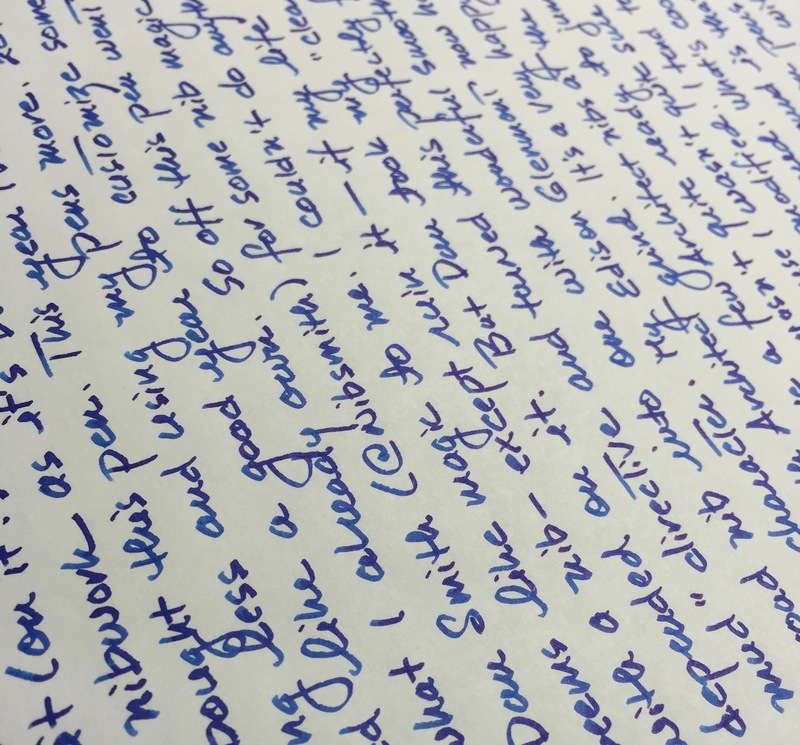 The ink behaves well and shades nicely—at least on the narrow range of papers I’ve used it on (Tomoe River, Life Bank Paper, this Levenger Vivacious Circa refill). 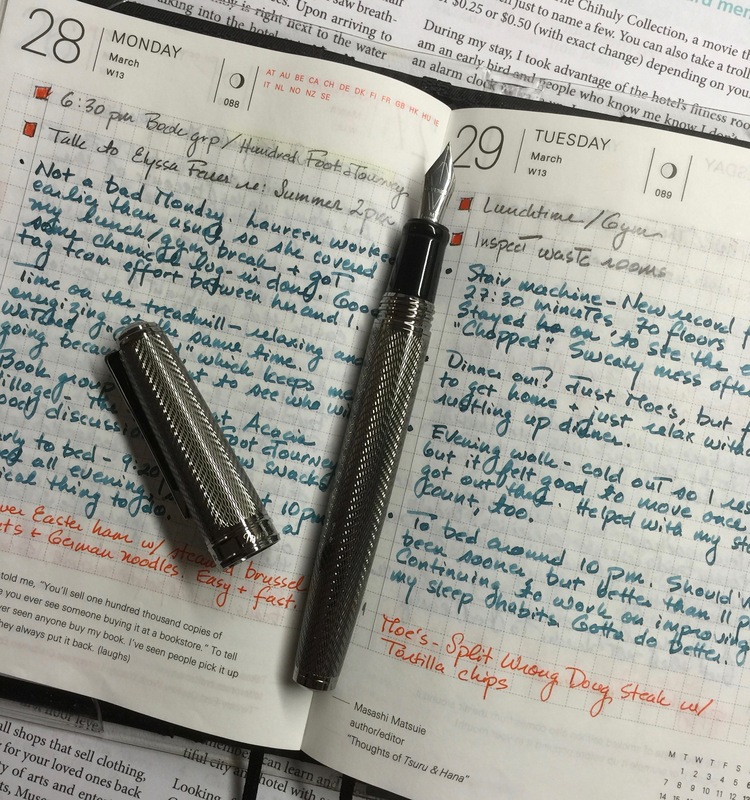 Like the modified nib on my Edison Glenmont, this custom-ground Levenger nib can be easily swapped into my other Levenger True Writers, like the pretty, pretty Kyoto. So now I have both a medium and a broad Architect grind, and feel sure that I’ll have the same done to a fine nib in the not-too-distant future. Dan does great work, at a fair price, with good turnaround times. 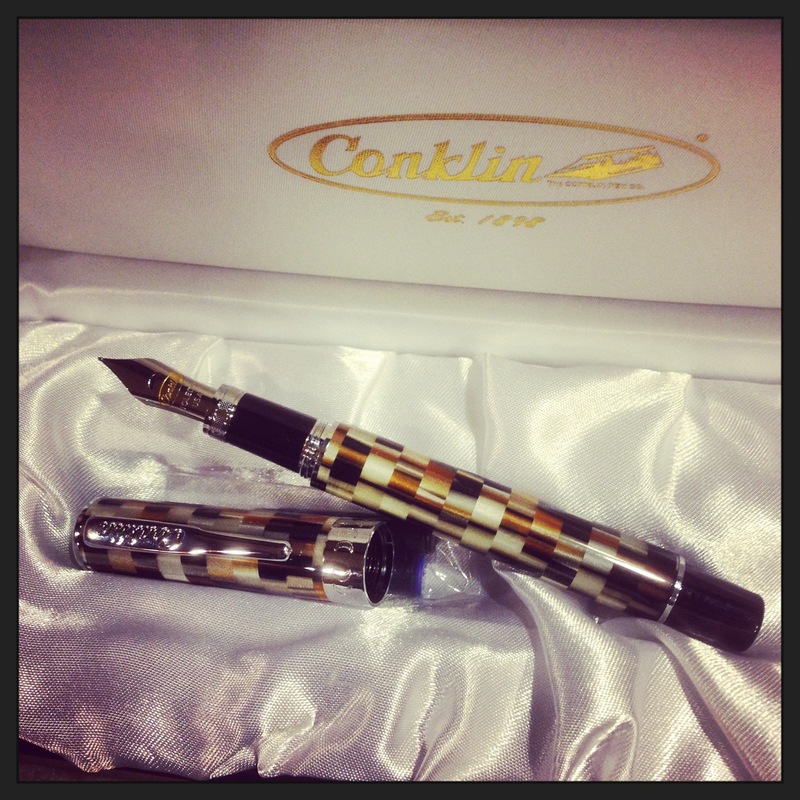 All of Dan’s nib services can be found HERE. There’s no charge for the added happiness. That’s included with each and every modified and expertly tuned nib. Life just keeps happening. My dad had some unexpected surgery yesterday and is currently recovering. At 87, surgery and hospital stays are no joke, but he seems to be doing okay. First my mom, now him. I haven’t been able to write here as much as I want to lately, but I’ll be here when I can. Lots of cool things in the queue! On a better note, I had an excellent appointment with my MS doctor last week, and he’s very pleased with how I’m doing. The appointment was a great incentive to keep at it in the gym with weights, cardio, and tai chi. Onward! 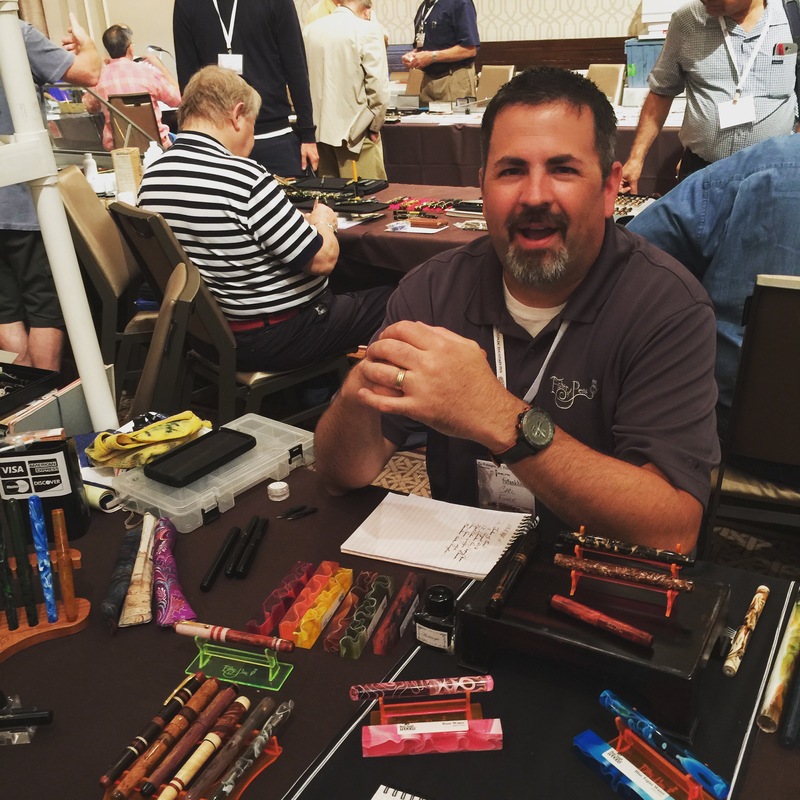 All pens, ink, and nib services mentioned here were purchased with my own funds. There are no affiliate links in this post. 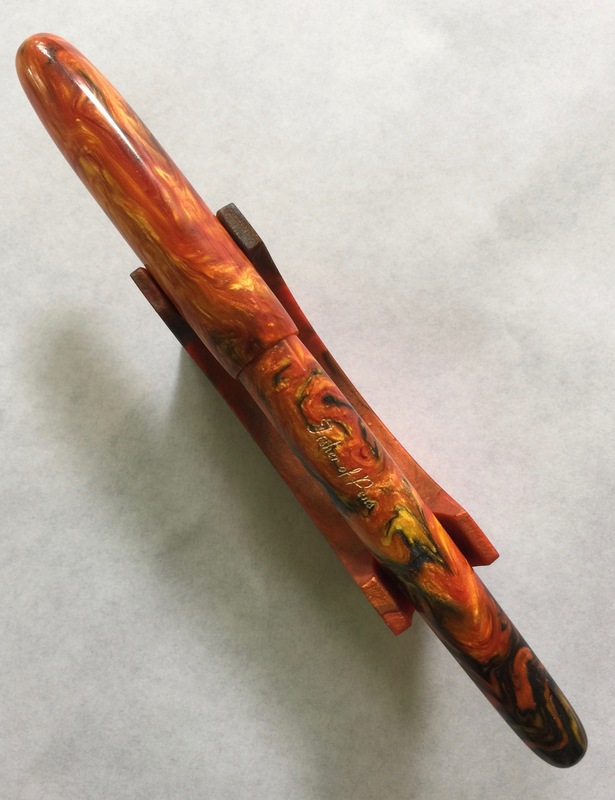 I bought this Edison Glenmont 2014 LEA (Limited Edition Acrylic), as part of an annual Edison Pen Co. group buy, with a broad nib, which was not my usual nib choice back then. But I had my reasons. Well, reason. I knew that, at some point, I’d probably like to have some sort of nib grind performed and figured that starting with a broad nib would give the nibmeister a good sized chunk of real estate to work with. Obviously I didn’t rush into the nib work as it’s been nearly two years since I bought the pen, yet I only recently took the nib-grinding dive. 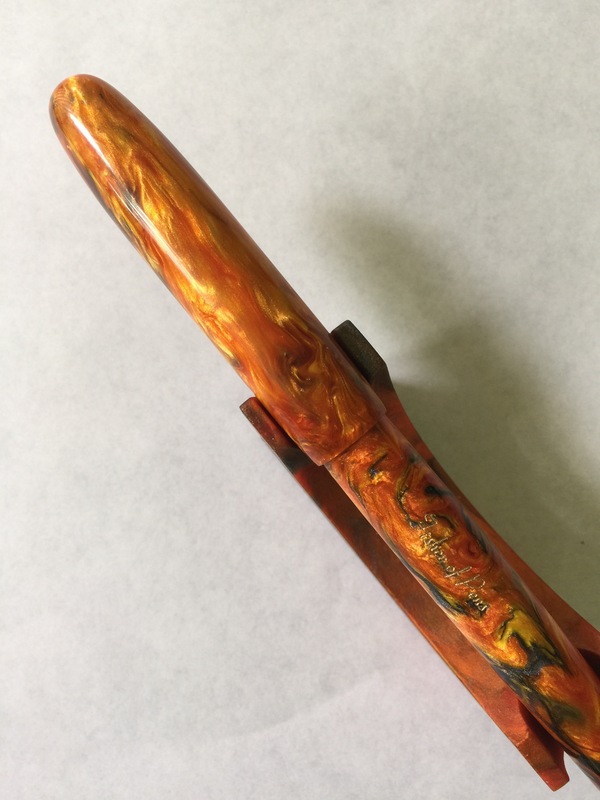 The Wine Acrylic on this Glenmont is stunning and almost looks like it’s lit from within. The chatoyancy mesmerizes me. And while the broad nib on this pen was very nice—smooth and wet—I felt that a pen this good looking could use a little something special. I’m trying to make 2016 the year of fewer acquisitions and more/deeper use, so it finally seemed like the perfect time to send this pen off to Dan Smith, The Nibsmith, for some nib magic. 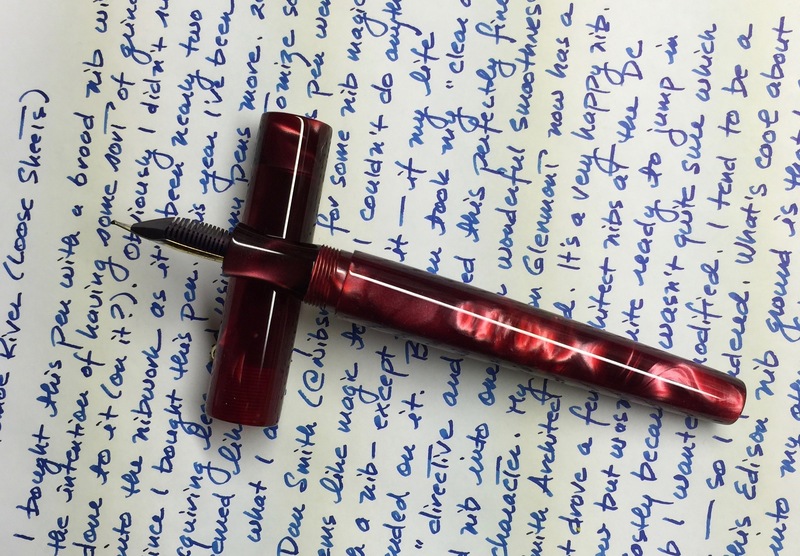 I couldn’t do anything with a nib—except ruin it—but Dan took my “clear as mud” directive and turned this perfectly acceptable broad nib into one with wonderful smoothness and character. My Edison Glenmont now sports a Dan Smith Architect grind. Dan explains an Architect (aka Hebrew or Arabic) grind on his website, saying, “You can think of this nib as a stub rotated 90 degrees. 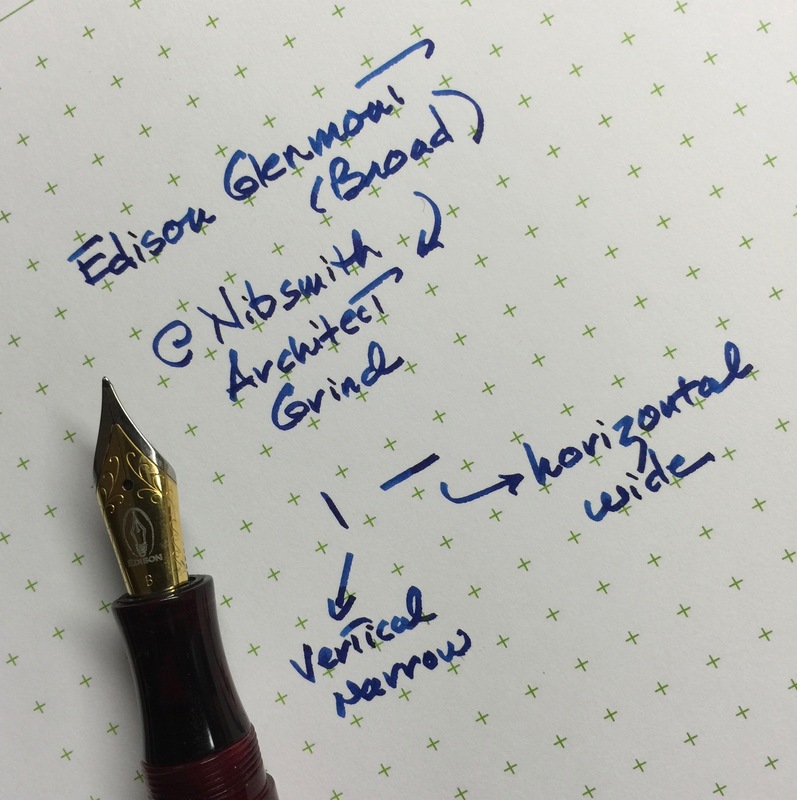 It creates a thin vertical stroke and a thick horizontal stroke.” I test drove a few Architect grinds at the DC Pen Show but wasn’t quite ready to jump in then, mostly because I wasn’t completely sure which pen/nib I wanted modified. I tend to be a ponderer—so I pondered. In the end, I came back to my original idea and sent off the Glenmont, and man, am I glad I did. This thing is crazy good. I filled the pen with a sample of Bungbox Sapphire and the combination of this ink with this broad Architect grind is sublime. It’s smooth and expressive and just plain fun. Capital F fun. Even without a macro lens, you can see the Architect grind. Impressive work, Dan. What’s cool about having this Edison nib modified is that I can easily swap it into my other Edison pens should I want to change things up. I like looking at writing from strange angles. 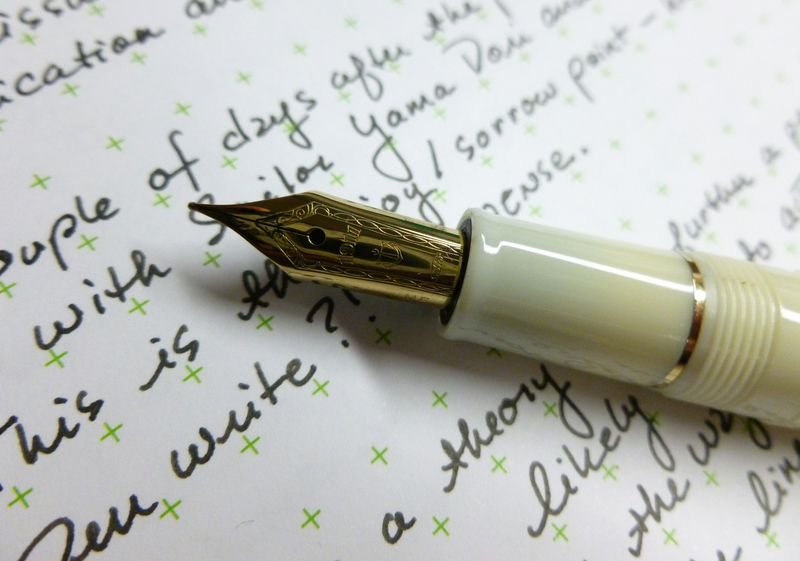 Rather than focusing on the words, you can focus on the ink properties and expressiveness of the nib. It’s a little quirk of mine. I couldn’t be happier with this pen or with Dan’s work. Just one little bone to pick—I have this wonderful Architect grind but it hasn’t helped my architect skills one iota. I still can’t design a house to save my life. 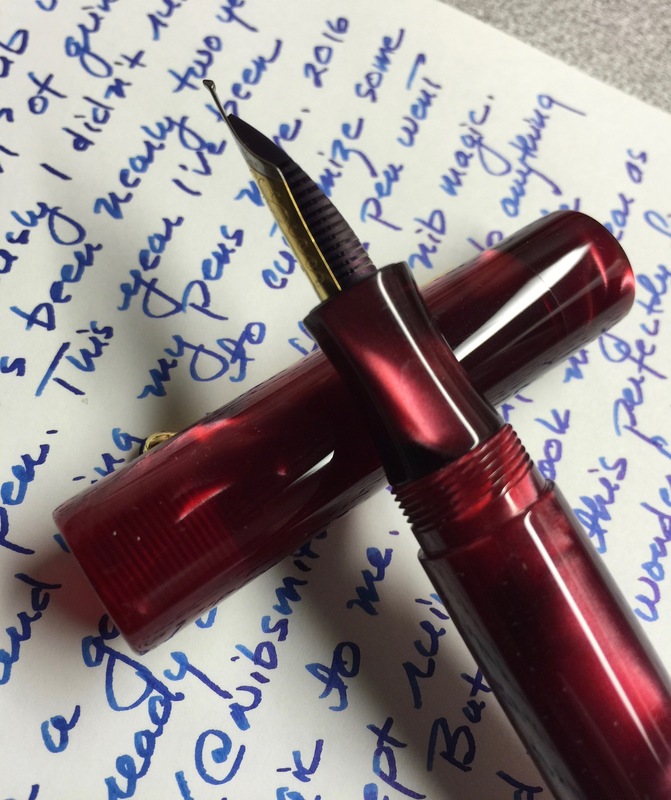 Okay, that “joke” probably made you groan, but I can assure, this nib will make you sing. Songs of high praise, that is. 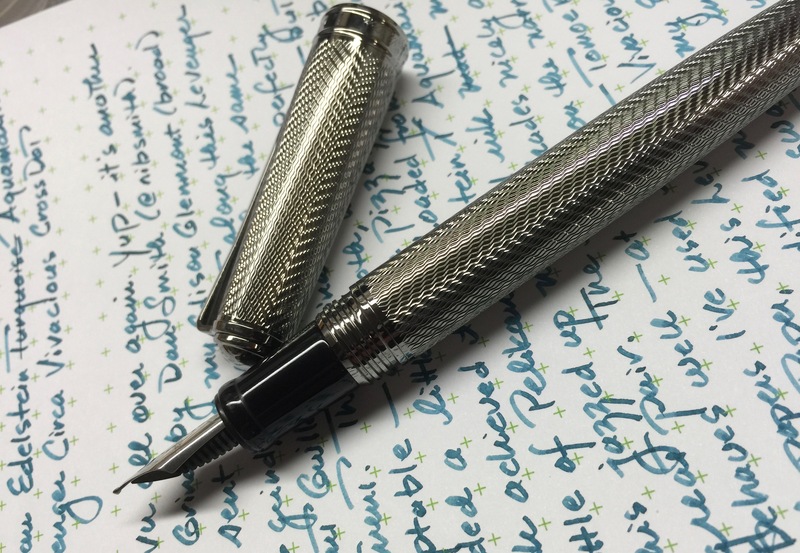 I paid for the pen and nib modification with my own funds, and I was not (nor will I be) compensated in any way for this review. The Bungbox Sapphire ink sample was graciously provided by my pen pal, Phil Olin (@SgtStretch). 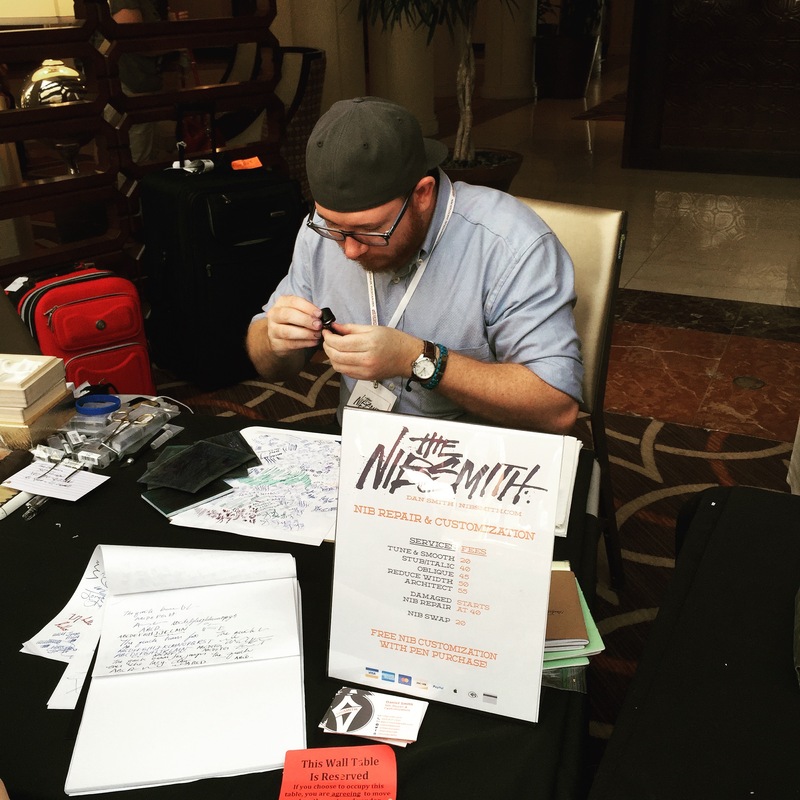 Check out all of Dan’s nib services at nibsmith.com. The Architect grind shown here costs $55 at the time of this review. 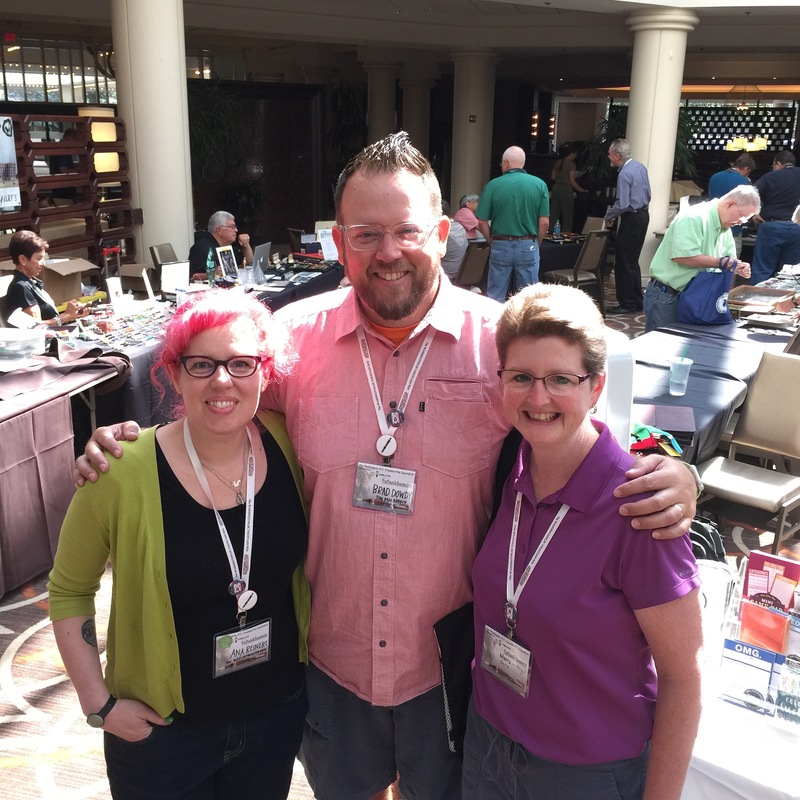 Prices for other nib services and grinds can be found on Dan’s website. I had planned to get a post up last week, but then I caught a cold (unexpected) and Christmas arrived (expected). One thing was fun, the other not so much. Slowly coming out of my sinus miseries and low-key Christmas celebrations to think about getting things back to normal. Well, normalish. Baking molasses cookies. Or as I call them, mole asses cookies. I’m off from work for most of the week— just have to pop in on Friday for a little while— so every day feels like Saturday lately. Which is what I imagine heaven feels like. 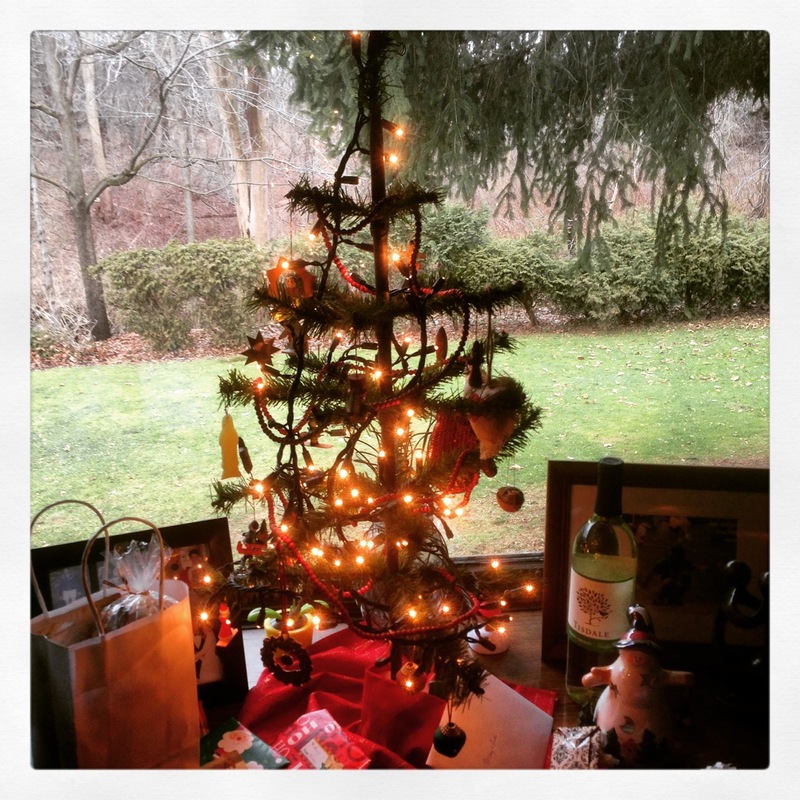 A couple of feelings routinely kick in this time of year, as one year ends and the other begins. The first is gratitude. Thanks for all of the good stuff and good people that I’ve encountered in the last year, much of it related to pens (and paper and ink and pencils) and the pen/pencil communities. These are the places where I feel most comfortable, where my introverted tendencies vanish, where I have a blast. 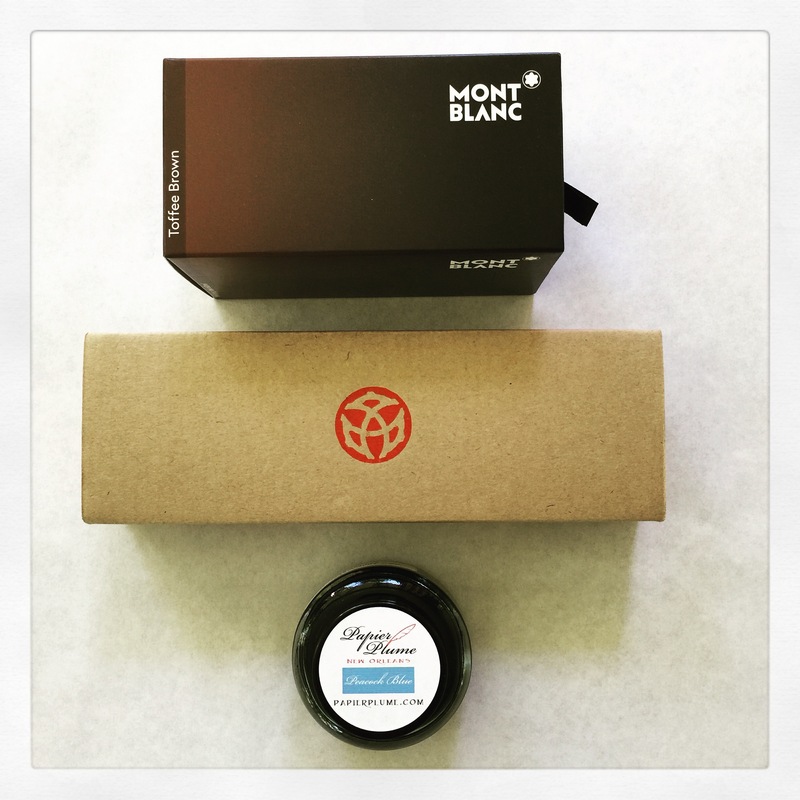 Thanks to some for supplying review items, to others for great customer service, and to all for great products and that extra-special personal touch. 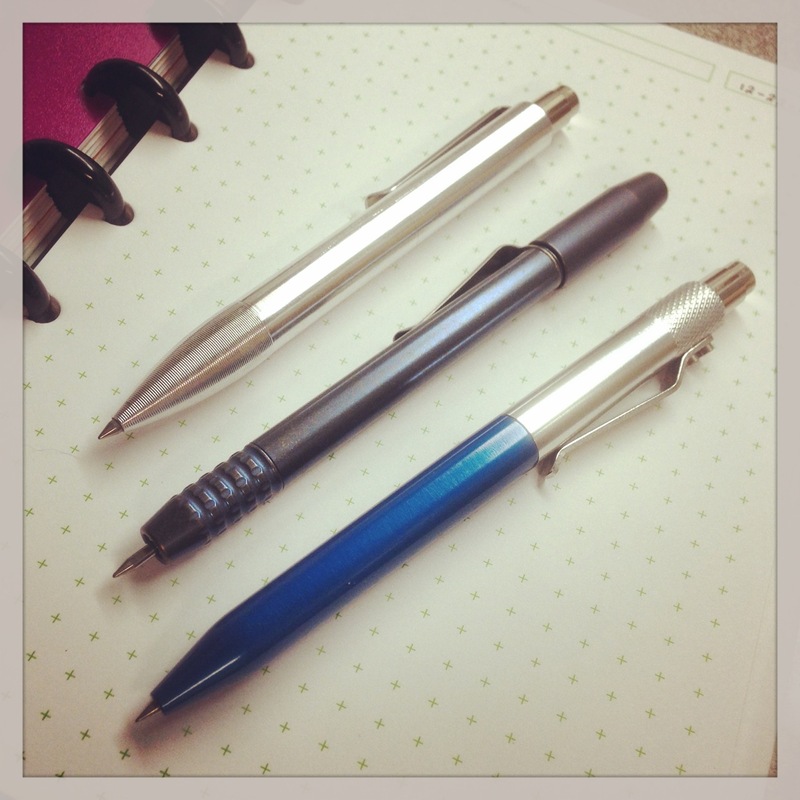 Thanks for making less than stellar pens remarkable, quickly and affordably. Great work! Thank you for understanding when I TAKE SO LONG TO REPLY. 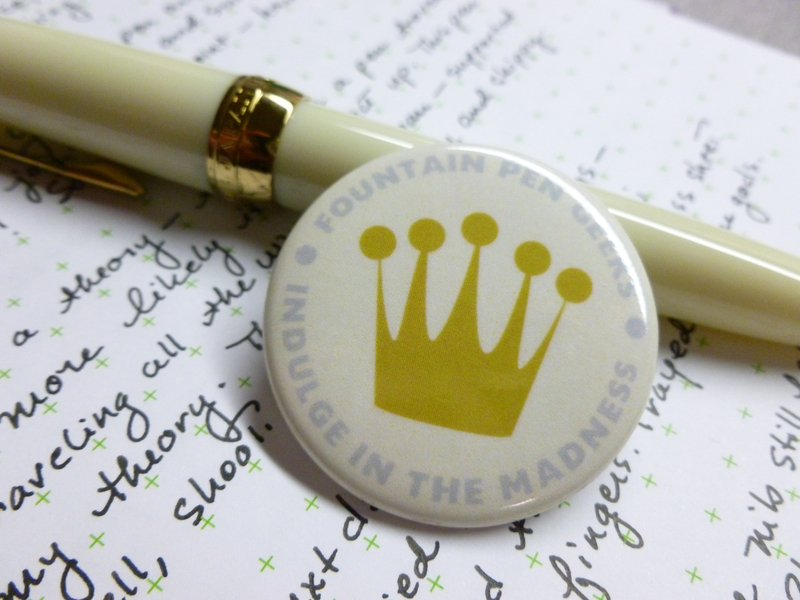 Your letters and cool envelopes are a source of delight in my mailbox. 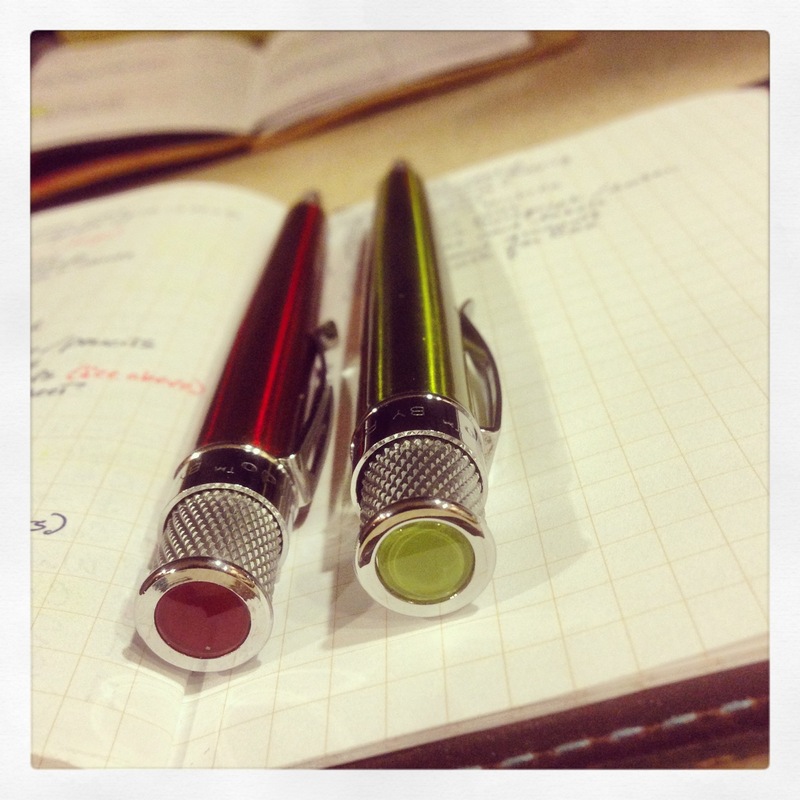 So glad we’re getting to know each other better while using our pens and inks. I won’t name names because I’ll leave someone out then feel bad, but you all entertain and educate me, amuse and enlighten. This is the BEST community. 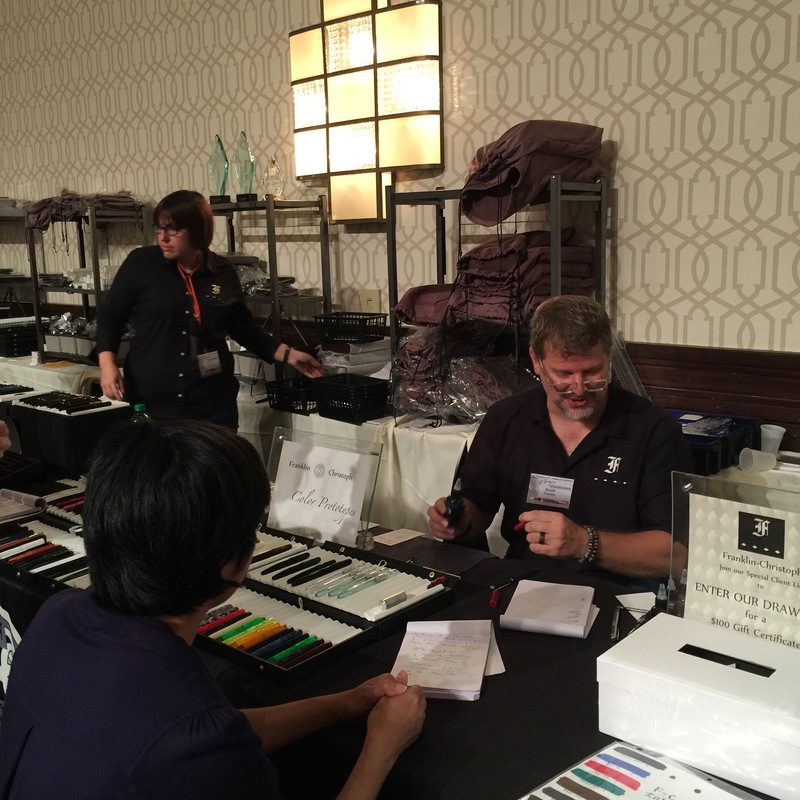 The Sheraton at Tysons Corner for returning my “left behind” Akkerman ink after the DC Pen Show. Amazing customer service. So grateful. The other feeling that kicks in this time of year is “fresh start.” Old year out, new year in. Time to purge, reorganize, and start with a blank(ish) slate. Fred and I regularly purge and straighten out our pantry during our break between Christmas and New Year’s. Annual ritual. 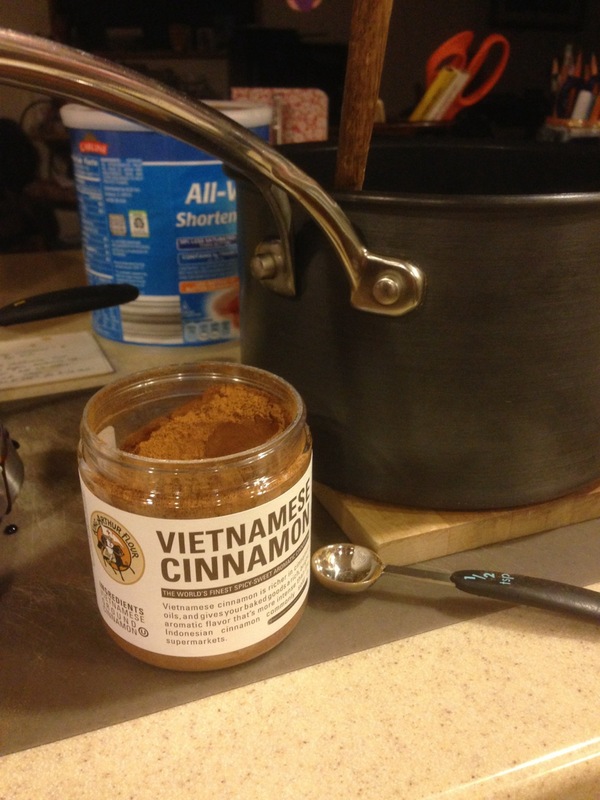 Afterwards, we vow to use what we have on hand before adding more stuff to the cupboards. In that same vein, I plan to make 2015 a year where I buckle down and USE my pens, pencils, papers, and inks— switching my focus from acquisition to using. When you have a Staples Printer Paper box full of empty notebooks, it might be time to stop buying notebooks and start writing in them. Like every day. Don’t get me wrong, I use my stuff but I need to REALLY use my stuff. There’s plenty here to be written in and written with, plenty to be reviewed, plenty to have fun with. Plenty. So I’m closing out 2014 and starting 2015 feeling grateful and blessed. And you— all of you— are the reason. Peace and good health to you all. 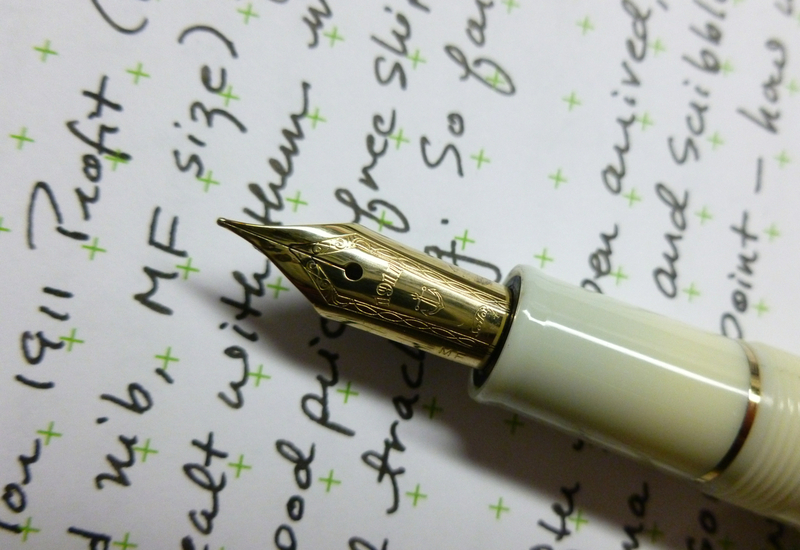 I bought this Sailor 1911 Profit (Ivory White Body, Iridium Gold Plated Medium-Fine nib) from Engeika (Japan), having dealt with them in the past without issue even though we are continents apart. 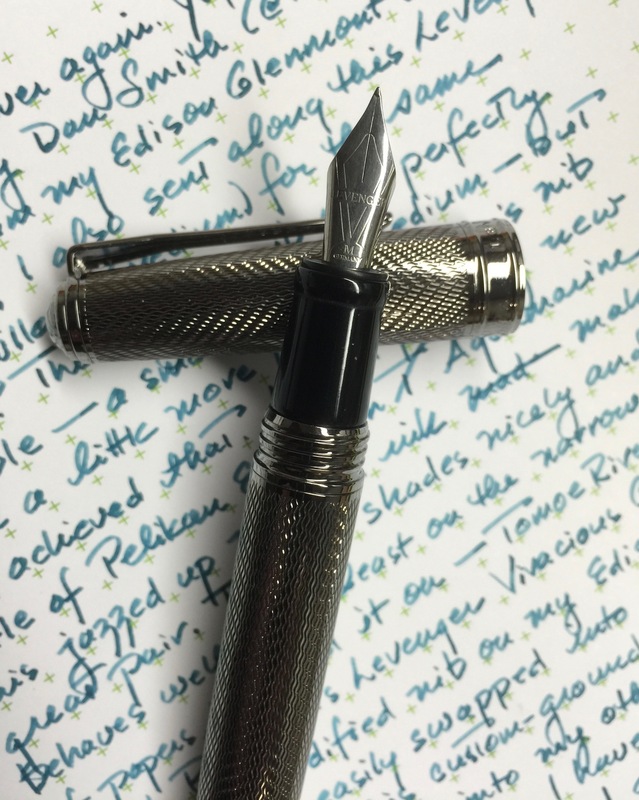 I’m not sure I buy the bit about this being a “rare pen,” but I was curious about Sailor pens and nibs and this seemed like a good, and reasonably priced, starting point. The transaction went very smoothly, with good communication along the way. A couple of days after the pen arrived, I inked it up and sat poised over the paper, ready to scribble away. (I typically write my name, or the name of the pen and the ink, or my dogs’ names, a million times.) This is always the high point of pen suspense— how will this newly purchased pen write?!?! As it turns out, not so hot. Well, #&@%. I have theory, borne out in this case, that the further a pen has traveled— the more difficult it is to return— the more likely it is to act up. This nib was dry and skippy. Really dry. Really skippy. Sad Mary. Crossed fingers. Prayed to pen gods. Though I wasn’t happy, I wasn’t overly distressed either. 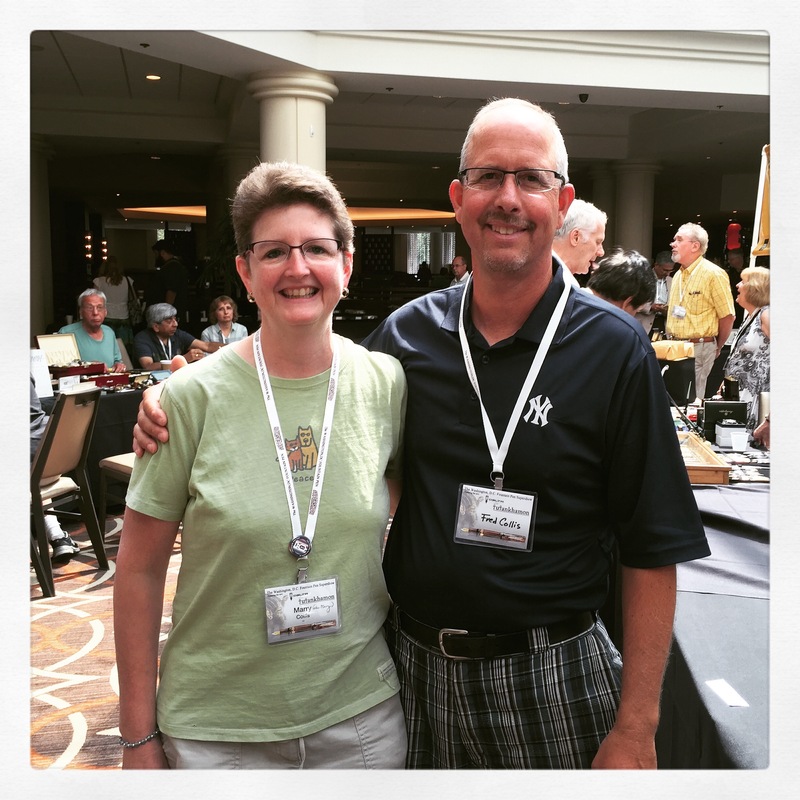 I immediately knew who could help me out— Dan Smith, Fountain Pen Geek and my go-to nibmeister. 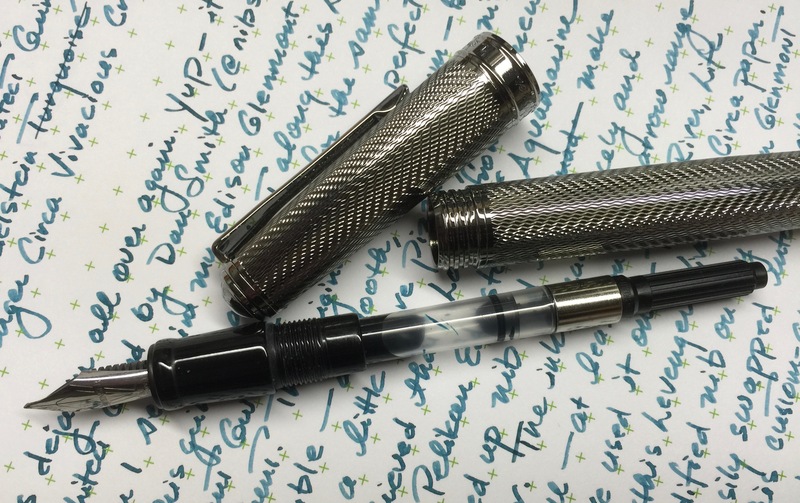 I’ve purchased a couple of used pens from Dan— some of my vintage favorites— and found him to be wonderful to deal with. 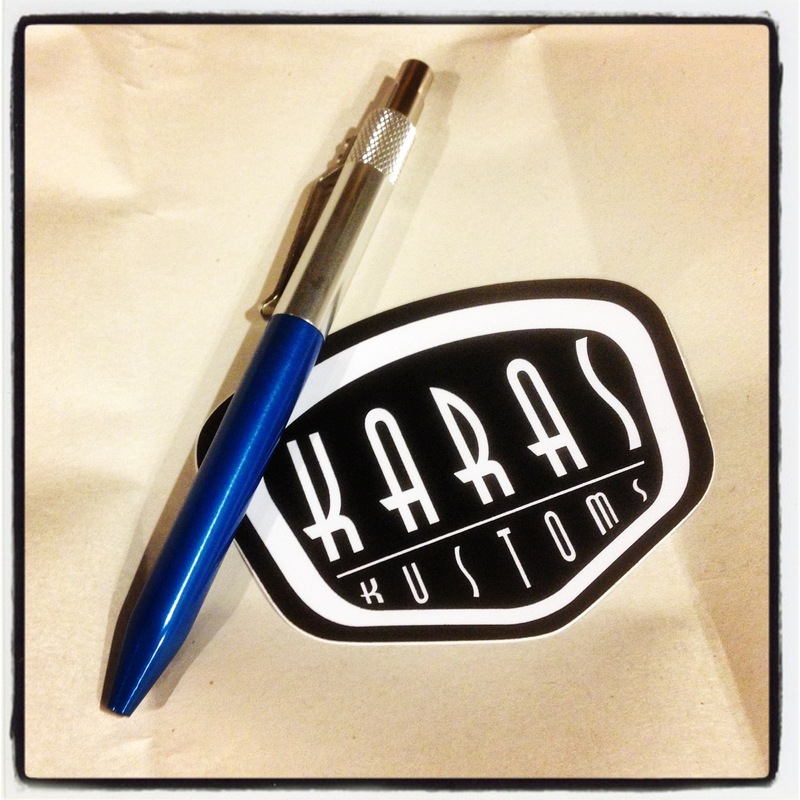 Satisfaction is priority #1, so purchasing a sight unseen pen from him is completely stress-free. 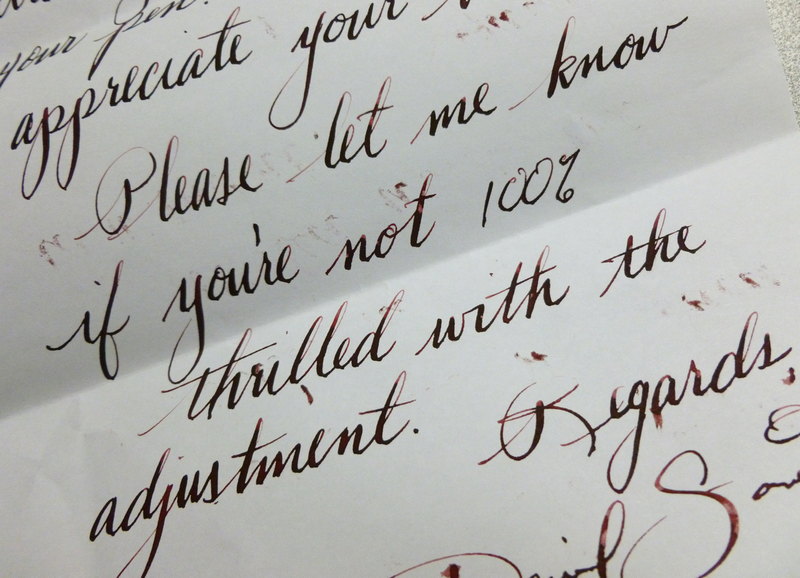 I had him tune a dryish nib some time ago, and immediately knew that he could work wonders on this problem child. I contacted Dan, packed up the pen (along with a writing sample) after getting the go-ahead from him, and mailed it off. Dan’s good about keeping you posted— emailing when he receives the pen and again when the work is completed, which in this case, was only a couple of days from receipt. 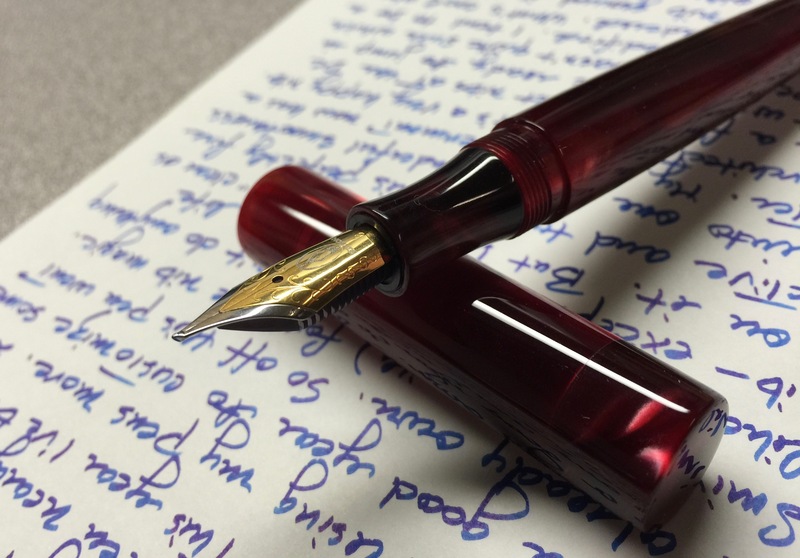 The newly tuned pen arrived a few days later— coincidentally on Fountain Pen Day. And it is awesome— smooth with spot on perfect flow. I couldn’t be happier. The whole process took about a week and the pen writes as I hoped it would when I ordered it. No more frustration. No more #@%&. Well worth the $20 (+ shipping to and from). Dan does stellar work, at very reasonable prices, with excellent turn-around times (though, of course, that depends on what he has in the queue). He’s who I think of when a nib needs work OR when I want one modified. 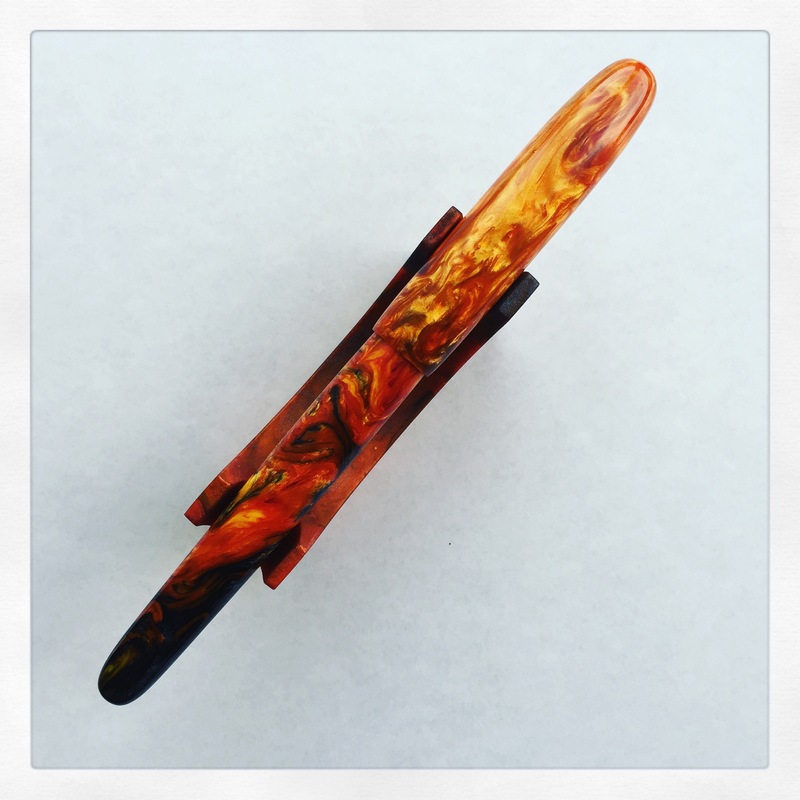 I purchased the Edison Glenmont 2014 LEA pen with a broad nib so that, down the road, I can have Dan do a custom grind on it. I’m thinking about a medium stub. Or Architect/Hebrew. Still pondering. Dan guarantees satisfaction. He wants you to be thrilled. 100% thrilled. And I am. Thrilled. 100%. 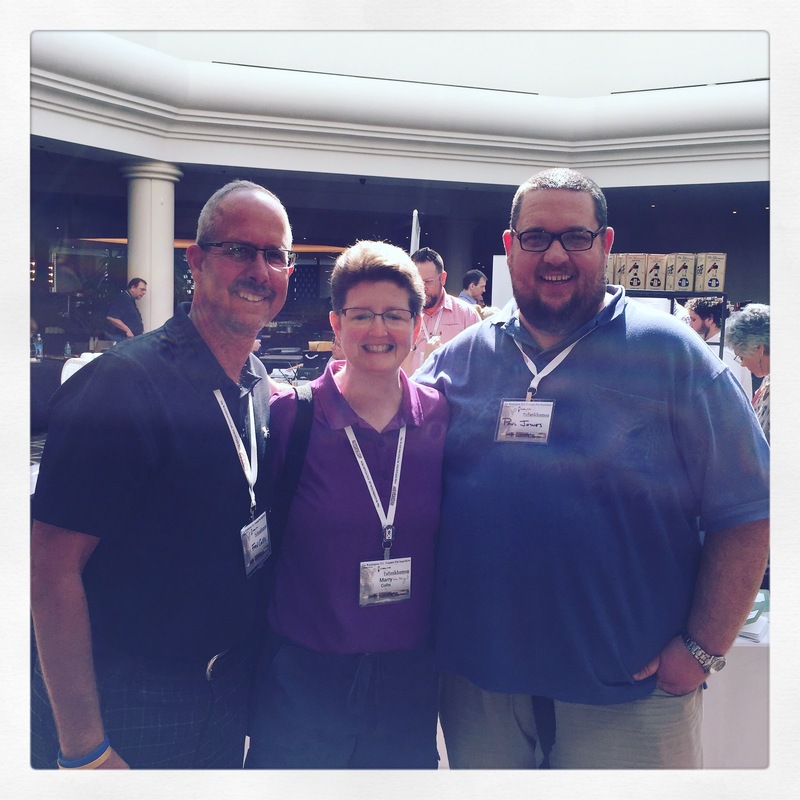 Check out Dan’s services, current turnaround time and prices HERE.